What do you do when you decide to start streaming your games? Do you plug your headset into your computer, open up Open Broadcaster Software, and start sharing with the world? That is certainly an option, though it might not provide the best audio quality. Once you start getting more into your hobby and building an audience, it might be wise to pursue options that improve the quality of your performance. When that time comes, a $129.99 Creative Sound Blaster K3+ could be the way to wade into deeper waters. 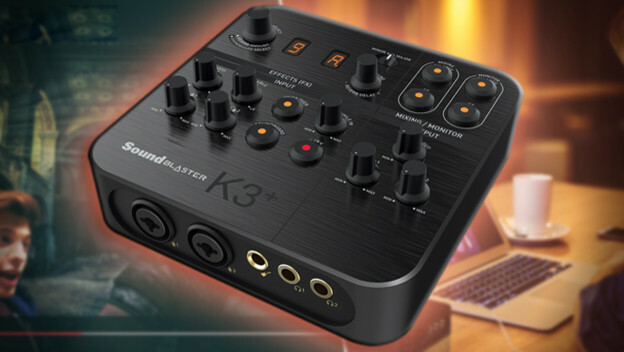 The Sound Blaster K3+ is a USB-powered audio interface and mixer designed with recording and streaming in mind. This peripheral is a clear, easy to understand device that does not require any sort of special drivers to get started. 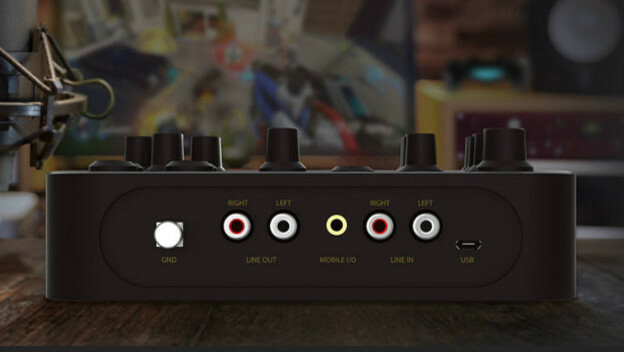 It was designed by Creative’s team with input from gamers and an array of musically inclined individuals to meet peoples’ needs, while also being a rather easy to understand, practically plug-and-play device. You set it up with your computer via USB or smartphone or tablet via 3.5mm audio jack and immediately use it for gaming, karaoke, chatting, or recording music. What is nice about the Sound Blaster K3+ is how clearly everything is labeled. At a glance, you can tell what every one of its knobs and buttons does. The Reverb Engine has nine effects built-in and lets you tweak each one’s delay and reverb. It has Autotune that goes from C major to B minor with a flick of a switch and twist of a dial to adjust reverb delay. You have mixer and monitoring switches, with FX options, so you can have wet or dry recordings, the ability to adjust the base and treble, and independent volume controls for both input and output. But the best part of the deal for streamers are the buttons for voice-over effect and soundboard clips. The former lets you push a button when you are streaming, so your voice is heard more clearly over the sound of the game. The latter has six sound effects that can be used when recording to cue six sound effects that include different kinds of laughter, cheers, and an entrance fanfare. Everything is laid in front of you, easy to see, so you can start working. The Sound Blaster K3+ is also full of features designed to make you sound better while broadcasting or performing. It supports 24-bit HD audio at 48kHz recording and 24-bit HD audio at 96kHz playback, to make sure things sound amazing. It has 48V phantom power, for studio-grade performances. Even having dual headphones, so you can be sure everything sounds okay, is important. Everything is there working for you. And, since it has two XLR / TRS combo inputs, you know your mics will be ready to work with it. With the price being what it is, you may wonder if you would use the Sound Blaster K3+ enough to make investing in it worthwhile. Look at it this way. If you are a gamer, then of course your primary use will be for streaming games or recording footage of yourself playing. Depending how many hours a week you play, that could be reason enough. If you are rather social and play karaoke games on your iPad or Android tablet, then this could offer another incentive since the Sound Blaster K3+ works with them. If you use services like Skype or Discord to connect with family and friends, then this accessory can come in handy there too. The more serious you get about recording or streaming your games, the more you may want to invest in that hobby or career. Making sure everyone can hear both you and the game is important. The Sound Blaster K3+ from Creative will help make that happen. Not only that, you can get practical use out of it when using it with communication applications or other musical endeavors. It is a device that can make a difference in your life.